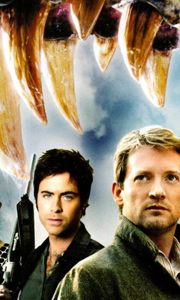 Own Primeval Series 1 DVD from Deff, DVD, Blu-Ray & 4K Video Specialists - Free UK Delivery..
Own Primeval Series 1 to 3 DVD from Deff, DVD, Blu-Ray & 4K Video Specialists - Free UK Delivery.. The complete seasons 1-5 of the dinosaur adventure series starring Douglas Henshall as evolutionary zoologist Nick Cutter, who discovers prehistoric creatures alive and well in the present day. Needless to say, the natural world is turned on its head and humanity faces a threat to its very existence. Unexplained anomalies are ripping holes in the fabric of time, allowing creatures from the very earliest stages of Earth's development to ..
Series One 0 When evolutionary zoologist Nick Cutter discovers prehistoric creatures alive and well in the present day the natural world is turned on its head and humanity faces a threat to its very existence. Unexplained anomalies are ripping holes in the fabric of time, allowing creatures from the past, and the future, to roam the modern the modern world. Cutter and his team struggle to keep the looming disaster secret while dealing w.. Professor Nick Cutter is having a very bad day. His estranged wife Helen has deceived him; tricking him into going through the anomalies one last time. But something has gone terribly wrong. Upon his return to the present, the world as he knows it has changed. And he and Helen are the only one's who know.Claudia Brown has never existed and the other members of Cutter's team have no idea who she was. Can Cutter convince them that their a.. The Primeval team are back and Nick Cutter is fighting to re-focus his embattled team who are still reeling from Stephen's death and the scale of Helen's betrayal. Cutter's crew are joined by some new recruits in the form of maverick policeman Danny Quinn, sparky Egyptologist Sarah Page, and the new leader of the ARC's security forces Captain Becker. But as the anomalies continue to present an unrelenting series of threats, the task in .. It's one year on and following the death of Johnson, the ARC has been shaken by the long-term disappearance of Abby, Connor and team leader Danny. The government has appointed entrepreneurial-scientist Philip Burton to take charge of the operation, with a brand new building and new team. Ex-soldier and zoologist Matt and the highly efficient if unconventional Jess also join the team, but are they ready for the challenges ahead? As Conno..
Own Primeval Series 4 DVD from Deff, DVD, Blu-Ray & 4K Video Specialists - Free UK Delivery..
Back at full strength with Abby, Connor, Lester, Jess and Matt on board - the ARC team must race against time once again in its fight to save the public from the terrifying creatures appearing through the anomalies. The members encounter vicious burrowing creatures, enormous underwater predators, a raptor on the rampage in Victorian London; a Tyrannosaurus Rex prowling the streets and a mass of ferocious future-beetles laying siege to t..
Back at full strength, with Abby, Connor, Lester, Jess and Matt on board - the ARC team must race against time once again in its fight to save the public from the terrifying creatures appearing through the anomalies. The members encounter vicious burrowing creatures, enormous underwater predators, a raptor on the rampage in Victorian London; a Tyrannosaurus Rex prowling the streets and a mass of ferocious future-beetles laying siege to ..